Blazon: A Camel Azure winged Gules. 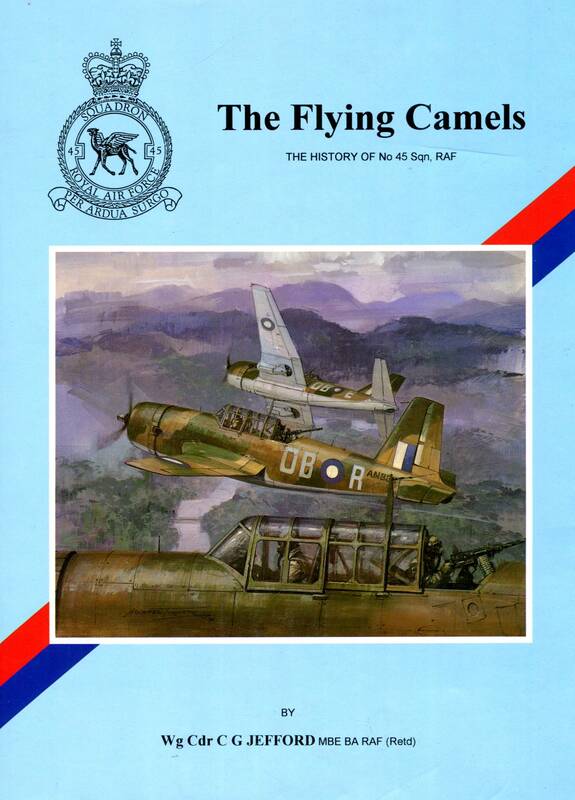 Link: The unit was equipped with Camel aircraft in 1914-18 and stationed in the Middle East for a long period. Motto: Latin: Per ardua surgo – Through difficulties I arise. History: Formed Gosport 1 March 1916 Disbanded 4 June 1976 Wittering. 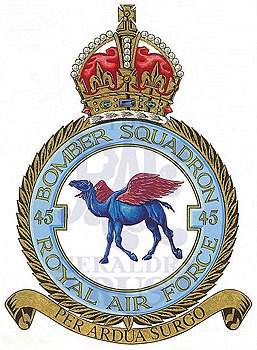 Note: No 45 Squadron has had two subsequent periods of existence in the shadow/reserve role. The first was from 1 January 1984 until 31 March 1992 when the number was allocated to the Tornado Weapons Conversion Unit (TWCU) at Honington and the most recent and current from 1 July 1992 when the number was allocated to the Multi-Engined Training Squadron (METS) at No 6 FTS, Finningley. No 45/METS moved to Cranwell on 1 October 1995, from where it operated its Jetstreams until March 2004, when they were retired; its new equipment being Beechcraft King Air 200s leased from and serviced by a civil contractor. Commissioned by the 45 Squadron Association in Memory of all who have served with No 45 Squadron. Battle Honours: 1. Western Front 1917-18. 2. Ypres 1917. 3. Independent Force & Germany 1918. 4. Egypt & Libya 1940-43. 5. El Alamein. 6. El Hamma. 7. Sicily 1943. 8. Gothic Line. 9. Arras. 10. North Africa 1943. 11. Salerno. 12. Italy 1943-45. 13 Gustav Line.